Poles and Polonia celebrate the adoption of Poland's Constitution on May 3. The 1791 Constitution contained many of the same ideas brought about by the European enlightenment that fueled both the American and French Revolutions and served as the basis for the American Declaration of Independence. 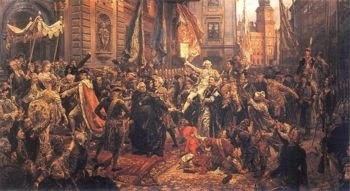 The 1791 Constitution granted equality between the nobles and peasant and effectively did away with serfdom in Poland. This brought about reactionary responses from Poland's neighbors and brought about the demise of the Polish republic and the partition of Poland by its neighbors Russia, Prussia and Austria in 1795. Poland remained partitioned for the next 123 years and did not re-appear on the European map until the Treaty of Versailles signed in 1918.